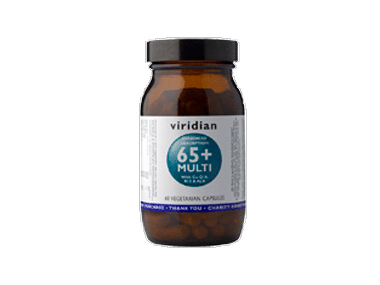 Buy Viridian Enhanced Absorption 65+ Multi - 60 capsules in the UK from our online shop or directly from our independent Scottish store. Specifically formulated to support the nutritional status in the over 65s, with added digestive factors. B vitamins and Iron contribute to a reduction tiredness and fatigue. Vitamin C and Vitamin D contribute to the normal function of the immune system. Vitamin D aids in the maintenance of normal bones. Vitamin B12 and folic acid contribute to normal homocysteine metabolism. Zinc contributes to the maintenance of normal vision. Cross-checked against common prescription medicines, but please check with your GP if you have concerns. We sell real Viridian and other Multi-vitamins directly from our shop in Scotland and online throughout the UK. View more products from Viridian. Where can you buy real 65+ Multi - 60 capsules safely online? If you are wondering where you can buy Viridian Enhanced Absorption 65+ Multi - 60 capsules safely online in the UK, then shop with us. We are an actual health foods shop; with real people selling real foods and products. Our award-winning independent shop is located in Stirling, Scotland since 1976. You can buy our Multi-vitamins in store or safely place an order with us online or over the phone. 65+ Multi - 60 capsules - Viridian Enhanced Absorption 65+ Multi - 60 capsules in Multi-vitamins and Vitamins and Minerals.